In 1935, when Portland lumber magnate Aubrey Watzek wished to build a house for himself and his mother, his friend John Yeon undertook to find a site and propose a design for the house. When Watzek balked at the untraditional design, Yeon suggested he contact Pietro Belluschi, who was then directing the A.E. Doyle architectural firm. Yet after seeing Belluschi’s design, Watzek returned to Yeon and the original proposal. Yeon worked through the Doyle office and managed the production drawings. 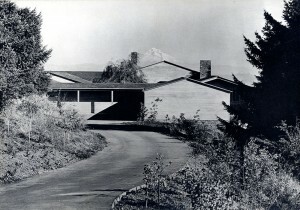 When he finished the construction drawings in early 1937, work began on the house. Yeon was just 26 years old. Sited on 3.62 acres in the southwest Portland hills, the design included the main house on the east portion of the property, and a chauffeur’s house on the west part. The site afforded magnificent views to the north (Mt. St. Helens), east (Mt. Hood), and south (Tualatin Valley), of which Yeon would take full advantage. It was Yeon’s intention to make the house a part of the landscape and not an imposition upon it. The construction of the house progressed rapidly under the direction of contractor Burt Smith, an extremely skillful builder, and by the end of 1937, the house was occupied. The house is U-shaped, centered around a formal courtyard, with two major axes; the west-east axis, which runs from the courtyard through the living room and culminates with a spectacular view of Mt. Hood through the living room windows, and a north-south axis that runs from the dining room, through the entrance hall, and culminates in the living room. The service wing flanks the courtyard on the north side, and the bedroom wing flanks the south side. A garden wall and covered porch flank the courtyard on the west side, and connect the garage to the rest of the house. The interior spaces include the large living room, library, guest room, dining room, two formal bedrooms, two servants’ bedrooms, kitchen, pantry, five bathrooms, and a large basement.